These images are a sampler of objects contained in the MIPSGAL and GLIMPSE surveys. Most of the images are a combination of light at three different wavelengths. 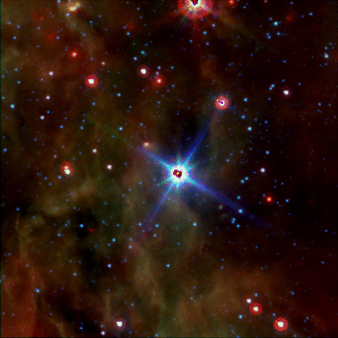 As Spitzer observes infrared light which is not visible to the human eye, we have to artifically color tag the data. The usual method is to color the shortest wavelength blue, the middle wavelength image green and the longest wavelength image red. This approximates what people would see if their eyes were sensitive to the infrared light being observed. For most of the images, we use a combination of 3.6 micron light as blue, 8.0 micron light as green and 24 micron light as red. The 3.6 and 8.0 micron data is from the GLIMPSE survey. Normal stars will look blue in this color scheme and will have red halo as the stars are more spread out by the longer wavelength camera. 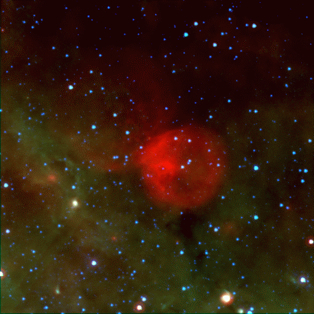 Most of the emission in our images is not from stars, but is from cosmic dust between the stars in our Galaxy. This dust permeates the Galaxy and is sculpted by the winds and radiation from stars into bubbles, pillars and other interesting shapes. This dust contains hydrocarbon soot which glows green in this color scheme and larger (but still very small) particles of silicates (like sand) which emit more at longer wavelengths and glow red. The varying color of the emission from this dust provides a lot of information on what the dust is composed of and what is heating the dust. Also of interest are the dark patches in some of the images. The dark patches are caused by dense clouds of gas and dust which block out the light behind them. 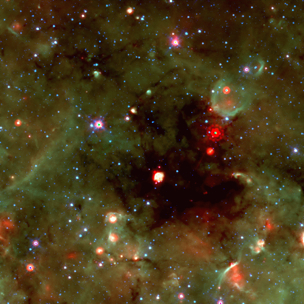 These "infrared-dark" clouds are objects which contain the raw materials of stars and in many cases are currently forming them. 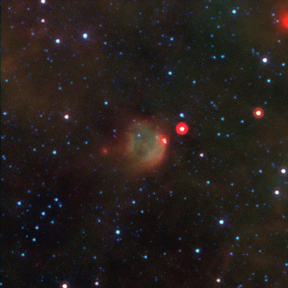 In fact, most of the red points in these images are stars in the process of forming. Typically, these objects are very young and are still gravitationally contracting. 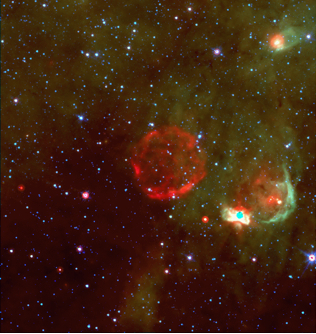 Other red pointlike objects are very old, cool stars which are surrounded by a dust shell.